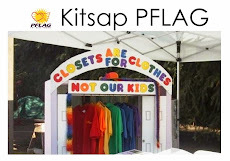 Looking forward to seeing you at our next Kitsap PFLAG meeting is this Monday, January 19 at 6:30 p.m., Martin Luther King Jr. Day. We are using a library room at the church which has a separate entrance from the main church. When you park, go in through the door to the far right of the building.